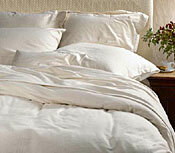 Simple contemporary styling and solid pine wood construction make this bed attractive and durable. 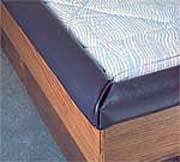 The Briarwood is today's improved approach to the bed that launched the entire flotation revolution! Includes headboard, frame, deck boards, and Standard 9.25" Pedestal, or choose other options below. Available in Honey Oak, Unfinished or Walnut finish. BUILD YOUR BED HERE USING DROP DOWN SELECTIONS. The Briarwood headboard comes with frame, deck boards, Standard 9.25" Pedestal, FREE Free Flow Mattress, Fill & Drain Kit, Liner & Heater. 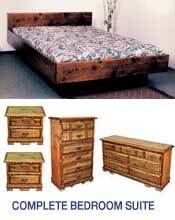 All Made In The U.S.A.
5-PIECE COMPLETE BEDROOM SUITE - SAVE $300! The Briarwood headboard comes with frame, deck boards, Standard 9.25" Pedestal, FREE Free Flow Mattress, Fill & Drain Kit, Liner & Heater. PLUS MATCHING CHEST, DRESSER & 2 NIGHTSTANDS!